Vincent Cox graduated as “Master of Science in Industrial Sciences” with a major in ICT. For his Masters’ Thesis, he developed a self-learning Web Application Firewall (WAF). It provides a high security level outperforming most WAFs (which are based on the OWASP top 10 vulnerabilities). Vincent also participated in several hackathons, such as “Hack The Future”, “Cybersecurity Challenge Belgium” where his team won several awards. Vincent started his professional career at The Security Factory (owned by the Cronos group), where he obtained further experience in the area of security testing of applications. During his time there, he also analyzed and compared various commercial and open source toolkits which are used to this end. Thereafter Vincent joined Ordina. During his time at Ordina, Vincent has excelled in his projects at a Telecom operator, several international heavy industry companies, government institutions and media corporations. He has learned valuable real-life experience in these multinational environments and understands better today how to manage large companies’ security risks and has helped them to become more cyber security resilient. Vincent also earned the CSX Cybersecurity Fundamentals certificate and is currently preparing the OSCP exam. He also shares his knowledge by speaking at public events, performing live hacking demo’s and writing blog posts. Dankzij de Aalsterse ethische hacker Inti De Ceukelaire en zijn hackerscollectief gaat er 16.200 euro naar vzw Clinicoders. Naar aanleiding van De Warmste Week nodigde het ethisch hackerplatform Intigriti tien hackers uit om de beveiliging van enkele grote bedrijven te testen. Wat de hackers daarmee verdienden, gaat naar het goede doel. Check out the repo here! Project is released on github! 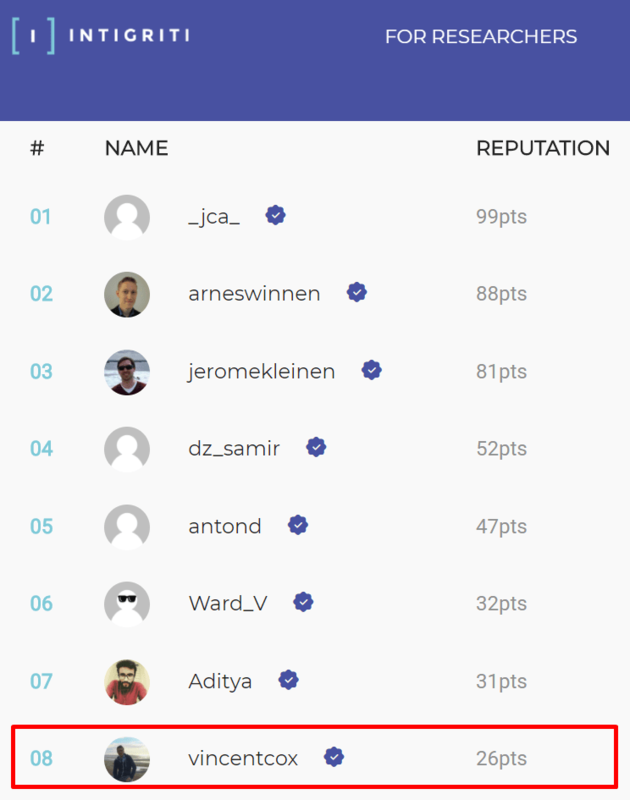 Made it into the top 10 on bug-bounty platform intigriti! More specific, place 8 at the moment of writing. It’s a platform where ethical hackers can submit security bugs and issues to big corporations like Telenet, Kinepolis, Brussels Airlines and Base. There are more than 850 hackers active on the platform, but the community is actively growing. I learned a lot during my time on the platform! Made it into the Intigriti Top 20! 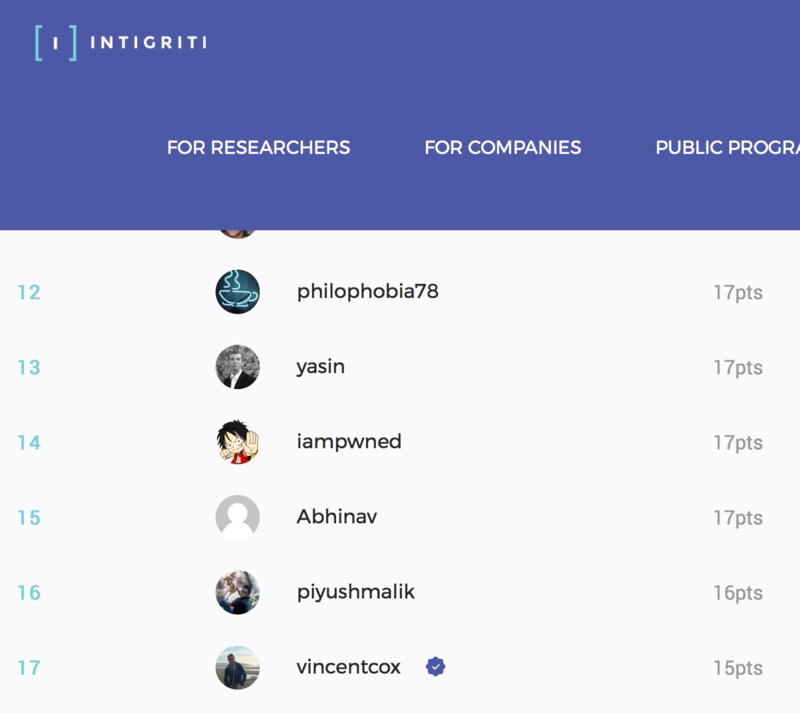 Intigriti provides an ethical hacking and bug bounty platform to identify and tackle vulnerabilities. A cyber security hackathon with a capture-the-flag approach. We participated in the security hackathon “Hack The Future”. We had to do solve challenges which contained decryption, security analysis, reverse engineering and pen testing. I developed a tool which extended a DJ program with new functionalities. My project got mentioned on sites like DJWORX and DJTECHTOOLS which are well known in the DJ world.